The list of foods that I refuse to eat is extensive: tofu, okra, stirred yogurt (yes, it's the stirring that gets me), and mashed potatoes, to name a few. Condiments are prominently featured: mayonnaise, butter, cream sauces, and ranch dressings are big no-nos. Friends call me picky, but that word feels inadequate—it evokes a realm of virulent food neophobes who subsist on a steady diet of pale, bland consumables and balk at the notion of trying anything new. I, however, embrace culinary novelties: glass potato chips, grilled whale, musk ox in yellow curry sauce. I’ve eaten harkl, the Icelandic delicacy where a poisonous Greenlandic shark is left to rot, then fermented for an extra kick. The chef Anthony Bourdain described harkl, whose redolent bouquet is not dissimilar from the acrid sensation of huffing a bottle of nail polish remover, as “the single worst, most disgusting and terrible tasting thing.” Trash-talking chef Gordon Ramsey allegedly threw up after eating it. But I’d rather subsist on a steady diet of harkl than eat anything covered in hollandaise sauce. My issue with the aforementioned foods isn’t their taste—it’s their texture. Compared to our rich vocabulary for foods’ flavor, America’s culinary glossary for food tactility is thin. A lemon, for example, might be described as acidic, tangy, citrusy, or sour—but how does that lemon feel? As eaters, we tend to downplay texture’s importance. A 2002 study in the Journal of Sensory Studies found that texture lagged behind taste and smell—and only occasionally beat out temperature—in terms of the perceived impact on flavor. But you only have to look at pasta to see how strongly texture impacts our perception of taste. We’ll eat macaroni and cheese in the form of spirals, shells, and noodles shaped like Spongebob Squarepants, but spaghetti mixed with florescent "cheese" powder seems anathema—it’s the texture that makes the difference. For the longest time, food scientists downplayed texture’s importance as well. “When I was a student pursuing a degree in food science, I was taught that flavor was a combination of mainly taste and smell," recalls Jeannine Delwiche, one of the authors of the 2002 study. But how a food feels affects our enjoyment of the thing. There is, of course, the actual texture of the food, which scientists call rheology. Rheology focuses on consistency and flow. For example, it’s fairly evident that cotton candy has a different texture than plain sugar, even though sugar is its only ingredient. But the perception of a food’s rheology—what scientists call psychorheology—is another thing entirely. 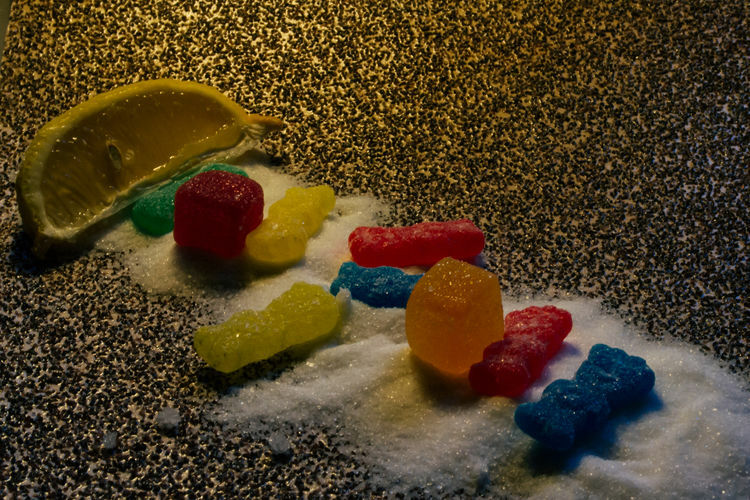 If you’ve ever wondered why sour candy always seems to come coated in rough sugar, the reason is simple: We perceive rougher foods as being more sour. Psychorheology is why we like gummy bears in solid but not liquid form, why we enjoy carbonated soda but balk at its flavor when it goes flat. It’s why we perceive gelato as creamier than ice cream—even though the latter has more fat. Texture is an important indicator of a food's fat content. If we can figure out how to trick our tongues into sensing more fat than is actually present in a food, we can increase satiation while decreasing a food’s calorie count. That's why some researchers are finally turning their attention to these taste-making sensations. Since the emergence of the “obesity epidemic,” the food industry has found itself under pressure to deliver healthier foods. Early on, they dealt with the pressure simply by removing whatever ingredient was currently in contention. An obsession with low-calorie foods lead to the rise of artificial sweeteners, while the low-fat fad of the '80s stripped foods of their richness but packed them with as much as 20 percent more sugar. The resurgence of low-carb diets in the '90s made sugar passé, so fat and artificial sweeteners were back on the menu. But these days, we want it all: People look for foods with moderate amounts of fat, little to no added sugar, and whole, "natural" ingredients—but with the same flavor as the fatty, sugary, artificially-flavored stuff they grew up with. A low-salt, low-fat potato chip with all the flavor of the ones we go for now would obviously be a huge coup. But the key to creating such a chip might not have anything to do with flavor. “Texture is a hugely important to what we do,” said Kristopher Bronner. Bronner is a co-founder of the candy company UnReal, along with his brother and his dad. “My parents are huge health nuts,” said Bronner. One Halloween, his younger brother Nicky—upset at having his Halloween candy taken away—exclaimed, “Why does something I love have to be so bad for me?” And thus UnReal was born. The Bronners take some of our beloved favorites—M&M’s, Reese’s Peanut Butter Cups—and reimagine them with at least 30 percent less sugar and 60 percent more protein, all without leaning on artificial sweeteners. That means paying attention to every detail, including texture. Take their rumination on the peanut butter cup, for instance: should it be one solid piece of chocolate with peanut butter filling pumped in, or should it be made in three layers? This apparently has a huge impact on how customers perceive the finished product. Harrison is trying to systematize what the Bronners are learning by trial-and-error. The computational fluid dynamics researcher and his team use computers to see how liquids behave (how the water in a tsunami acts when it hits a city, for example). He was initially brought on to model how the Australian Olympic diving team moves through the air and hits the water in order to help reduce injury and improve performance. CSIR is public-private partnership, and both the Australian government and the Australian food industry were facing complementary problems: how can the government improve eating habits to enhance public health, and how can companies can make healthy foods the public wants to eat? To solve that problem, they turned to Harrison, who put his biomechanics background to another use—modeling what happens to food when it enters our mouths. Harrison uses modified versions of the same models his team uses to predict tsunamis to make computer models of the mouth. The models represent all of the aspects of anatomy—the shape of the teeth, the gums, the palate, the cheek, and the throat—and how it all moves when eating a given substance. “We take our best available representation of the food structure, previous knowledge of how the structure relates to the mechanics of the food, how sticky is it, how strong is it, if you crush it, how many pieces does it break into it,” said Harrison. A lot happens inside of our mouths between the first bite and the final swallow. The tongue may gently nudge the morsel towards the central incisors—whether to the left or on the right is a matter of unconscious preference—to break food down to even smaller pieces. The pieces may linger there, or get shunted to the back molars, or the tongue may shift them wholly to the other side. Alternatively, pieces may rest chipmunk-style in the cheek sacs along both sides of the mouth while the molars get to work. Or, depending on the person and the food, the piece may linger on the tongue, where salivary acids let it soften a bit before chewing even begins. Food sensory researchers from The Understanding & Insight Group, a consortium of scientists from the U.S. and New Zealand, break these chewing preferences into four categories. Chewers prefer foods that can be chewed for a long time, like gummy candy. Crunchers prefer foods that respond with a resounding crunch, like potato chips. Suckers prefer foods, like hard candy, that dissolve slowly over time. And smooshers, the laziest of all eaters, prefer soft creamy foods that spread across the mouth with minimal effort—like puddings. Modeling this turbulent behavior isn’t easy—traditional imaging devices don’t work so well when the subject is moving—but it’s important. “Where we put food in our mouth will affect our perception of its texture,” says Harrison. The way our mouths interact with foods affects how enjoyable we find different formulations of ingredients. Adults, for example, enjoy a complex textural experience, which is why many chocolate bars come with nuts—the texture just adds a certain something. Why does crunch change our flavor perception? Although we tend to use the words "taste" and "flavor" interchangeably, taste is related to our chemical senses—the sweet, sour and bitter notes that we register from chemical sensors on the tongue. Barnett-Cowan’s work focuses on how the brain takes discrete sensory inputs like taste, touch, and smell and cobbles them together into a single, holistic impression. Flavor is why a dash of vanilla extract seems so delicious in a moist cupcake or in creamy scoop of vanilla ice cream. Taste is why, as many have learned in a fit of childish curiosity, drinking vanilla extract is an exercise in repugnance—the extract is little more than vanilla bean soaked in cheap vodka. Even though the menthol—the taste—is still present, the dwindling sugar content robs the gum of its flavor. “If you put sugar onto the chewing gum you'll start to taste the menthol again,” Harrison said. But while we tend to think of flavor exclusively in terms of taste, texture matters too. Gummy bears, for instance, are basically just a combination of sugar and thickening agents. “If you were to liquefy it, it becomes so sour and so sweet that people couldn’t bear it,” said Harold Bult a Senior Sensory Scientist with the Netherlands-based company NIZO. Bult has found that the thicker a food is, the less we taste it. But while texture may be relatively new to food scientists, most agree that chefs have been tackling the issue—albeit from a different perspective—since time immemorial. “The building blocks of the eating experience are flavor and texture,” said Tesi Wei Lim, who runs the Somerville, Massachusetts based restaurant Journeyman with his wife Dinana Kudayarova. Journeyman is noted for playing with food texture. And the reason why every sandwich seems to be covered with mayonnaise? Moist foods carry taste better, according to Wei Lim. Mayonnaise is a (supposedly) neutral form of moisture. Attention to texture may also vary from culture to culture. “My family speaks a dialect of Chinese for which there are a huge number of words for texture,” noted Wei Lim. “There’s a word for the texture of thoroughly cooked squid, and a word for a squid when it’s lightly stir-fried and still bouncy.” QQ in some Chinese dialects describes the texture of food that when you first bite into pushes back for a moment before relaxing. It's a word that describes the texture when you bite into the balls at the bottom of a boba or bubble tea, or of Udon noodles. It's hard to think of an American food that has it. And even though Americans tend to rank taste as more important than texture, there is one exception: desserts. Susan Strauss, a linguist at Penn State University, found that when Americans talk about dessert we lean toward words like moist, dense, creamy, sticky, gooey, oozing, and dripping—textural words. But the rest of our food remains pretty flat. Not that the stock itself isn't a delicious textural enigma. Wick never did solve that riddle. Identifying the requisite compounds was impossible with the technology of the time. Here’s to hoping that food scientists of the current era have better luck.